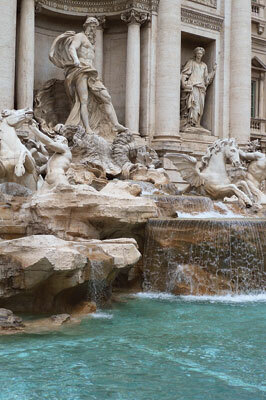 The Trevi Fountain is located in the Trevi district of Rome. It stands 26 metres high and 20 metres wide. As well as being the largest Baroque fountain in the city, the fountain is one of the most famous in the world. Every day it spills 80,000 cubic metres of water. The design of the Trevi Fountain is based on three architectural elements: a facade made of travertine, statues of Carrara marble and a sea reef also made of travertine. In the middle stands the sea God, Neptune, at 5.8 metres high, carried on his triumphal chariot by two horses jockied by two Tritons. One horse is restless; one is calm. One triton is strong and young; one is older and holds a twisted shell that he is using to announce their passage. The Tritons and horses provide symmetrical balance via the contrast in their moods and poses. Neptune is framed by free-standing columns for maximum light and shade. In 1730 Pope Clement XII organised a contest to design the fountain which was won by Nicola Salvi. Work began in 1732, and the fountain was completed in 1762, long after Clement's death when Pietro Bracci's Neptune was set in the central niche. There is a long-standing traditional legend that visitors who throw a coin into the fountain will be ensured a safe return to Rome. This theme was immortalised in the 1954 film Three Coins in the Fountain.